Mangaluru, Apr 05, 2019: DK DC S. Sasikanth Senthil on April 4, Thursday directed the Mangaluru City Corporation to clear all silt from all major storm-water drains in the city, well before the monsoons set in. 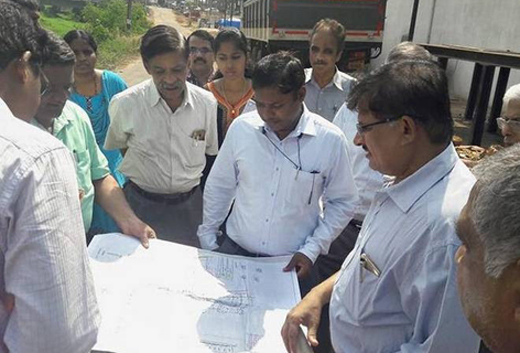 DC Senthil was carrying out an inspection in Kottara Chowki and surrounding areas that were affected by flash floods during the pre-monsoon rain last year. He asked the corporation commissioner to summon those who have created obstacles to the free flow of rainwater and get such obstacles removed. Presiding over a meeting earlier on the Smart City project at the corporation, DC Senthil directed the officials concerned to submit weekly reports on the progress of work every Saturday. He said that because of non-coordination between the corporation, Public Works Department and other departments concerned, works are overlapping and people are raising concern over such issues. He said that all departments, the corporation, BSNL, MESCOM, Railways and the Police have to work in tandem. Works have to be completed so as to benefit the targeted beneficiaries, he said. A forum of technical officers has to be formed for work evaluation and the report has to be submitted every Saturday. Stating that Smart City inter-department meetings should not be conducted for namesake, he asked the corporation to examine the feasibility of erecting solar panels across the city, including up to Mangalore University campus, to generate green energy.